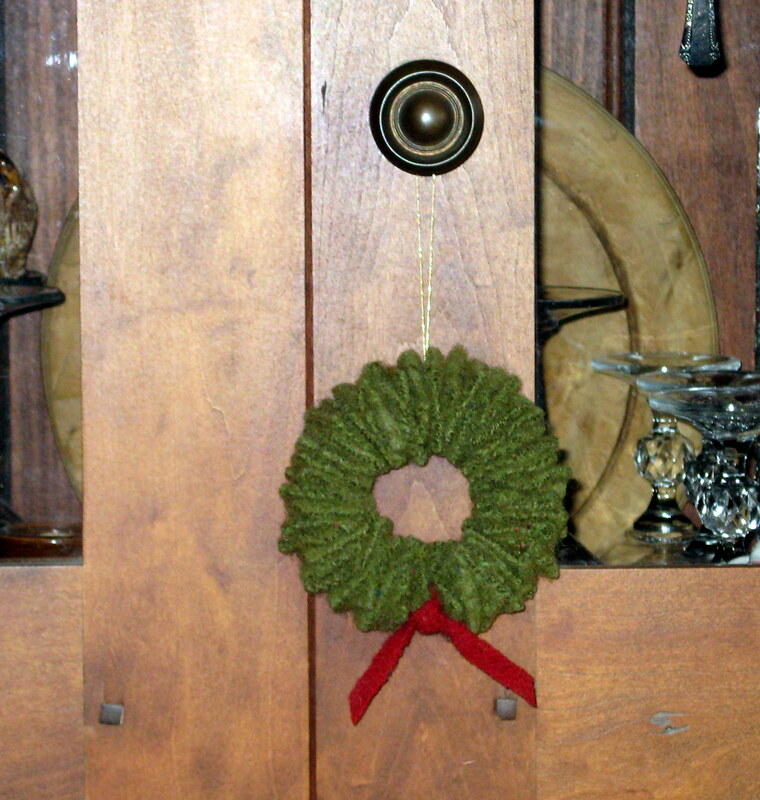 Here’s another quick (and child proof) project for the holidays…mini wooly wreaths! They can be used as door hangers, package tie-ons, ornies for the tree, a little gift for a friend ~ you decide! Materials List: You’ll need recycled wool fabric (recycled/felted sweaters or rug hooking scraps) any color will do! I’m pretty traditional, so I like green and red. But, white would be dashing as would multi-colored! Since my wreaths are meant to be small, I cut my fabric into 1-inch squares, but you can make the wreath any size you desire. You’ll also need wire, a workable/bendable gauge. Just cut a length of wire and poke it through the center of your cut fabric squares until you get the size (and density – no wire should be visible) you prefer. Twist the ends together. Add a strip of wool or ribbon and a length of gold thread for hanging. You can also embellish with beads, bobbles, glitter and more! You decide. Let’s see…how many should I make??? 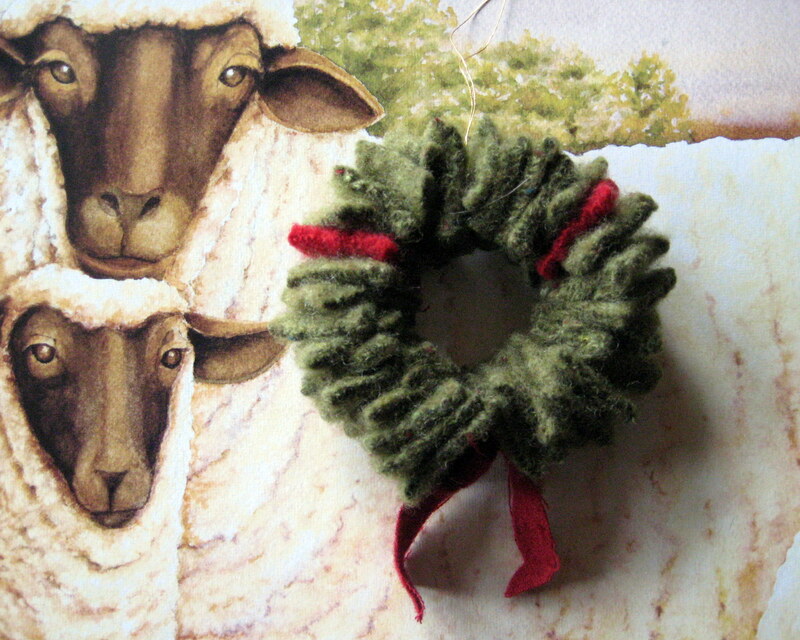 This entry was posted in Projects and tagged mini wool ornie, recycled wool, wool wreath by Sheepy Hollow Farm. Bookmark the permalink. SO cute Jenny! If you knew how many (bins of) felted sweaters I have around here….. I’m sure there are some green ones in my stash. I’m going to make a couple of these. Adorable! Thanks for the idea! Those have a warm, old-world, country, understated look. Lovely. And, yes, how could you have too many? Love your Home For Christmas banner….beautiful. It reminds me of Far From The Madding Crowd. You’ve been doing lovely things with your site since I last visited. Thanks! The wooly wreaths are addictive…and so much fun to make! I think we can all pretty much relate to this sudden cold snap!!!! Brrrrr!